The PIR2 is a low cost handheld data collector well suited for asset tracking, guard tour management, or any application requiring a definitive audit trail. The PIR2 works along with Maxim/Dallas Semiconductor iButtons. iButtons are small rugged electronic devices which contain a guaranteed unique serial number. Each time an iButton is presented to a PIR2 the PIR2 reads and stores the iButton’s serial number along with a date/time stamp. These records are later downloaded to a Windows PC and they form the basis upon which a custom audit system may be constructed. Each PIR2 has a guaranteed unique serial number. The development kit includes two PIR2s, which enables solutions which track multiple PIR2s to be developed. Enough iButtons are provided to allow non-trivial modeling of real world solutions. The host interface supplied is USB based; however, a serial host interface is also available. The PIR2Srv isolates the end-user software from the communication details. This means a simple configuration change is all that is needed to switch between USB and serial (there is no impact on the end-user software). The PIR2Srv Suite contains all the functionality needed to move the data from a PIR2 to a Windows PC. The PIR2Srv is implemented as a Windows Service supported under XP (32 bit), Vista (32 bit), and 2003 Server. A service was selected because it gets the PIR2Srv out of the view of the end-user. This allows the user to focus on your custom solution removing Embedded Data Systems from view. The PIR2Srv provides support for all communications, configuration, and troubleshooting. A simple dotNet sample is included which provides a class encapsulating the PIR2Srv interface. The class included in the sample application handles all communications, threading, and clock synchronization. This greatly simplifies the job of the application developer. All the documentation necessary to develop a solution has been included on the PIR2Srv Suite CD. This documentation is also copied to the development PC during development kit installation; as it is always a time saver to have all the information needed in one convenient location. The deployment of the PIR2Srv is easily handled by using the included setup executable SetupPir2.exe. For users desiring finer control over the installation process the setup script SetupPir2.nsi is also included. This script works with the open source windows installer NSIS nullsoft scriptable install system. 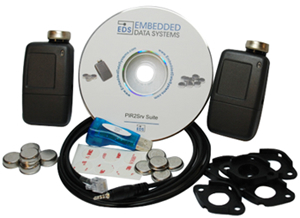 As you can see Embedded Data Systems’ has laid the foundation for great, royalty free PIR2 enabled applications!